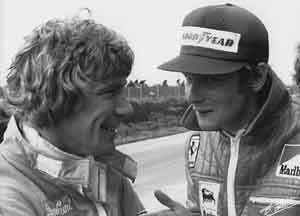 With Ronnie Peterson having won the Monaco Grand Prix a few days earlier there was much excitement in Sweden when the teams arrived at Anderstorp 10 days later. Once again the organizers decided to restrict entries and so there were only 27 cars present. Hans Stuck was out of action because of his broken thumb. He was replaced in the factory March by local hero Reine Wisell. Arturo Merzario was also in trouble having broken a finger in a sportscar crash at Imola and although he practiced for Iso Marlboro in Sweden his place was eventually taken by Tom Belso, while Richard Robarts was in the second car. Brian Redman had left the Shadow team and his place was taken by Sweden's Bertil Roos. In addition BRM did not have time to repair all its cars and so Francois Migault was left without a a drive. Qualifying resulted in Patrick Depailler and Jody Scheckter sharing the front row in their Tyrrell 007s with the two Ferraris of Niki Lauda and Clay Regazzoni on the second row. Ronnie Peterson was fifth alongside James Hunt (Hesketh) while the fourth row featured Jacky Ickx (Lotus) and Jean-Pierre Jarier (Shadow). The top 10 was completed by Emerson Fittipaldi (McLaren) and Carlos Reutemann (Brabham). At the start Scheckter took the lead with Peterson slipping ahead of Depailler to take second place. Lauda and Regazzoni followed with Reutemann completing the top six. For the early laps the order remained unchanged but on lap nine Peterson's Lotus stopped with driveshaft failure, leaving the two Tyrrells out in front. Then came the Ferraris. On lap 24, however, Regazzoni disappeared with a gearbox failure and so Hunt took fourth position, having overtaken Reutemann a few laps earlier. The Argentine driver retired with an oil leak on the 31st lap and so Fittipaldi moved into fifth with Hulme sixth. On lap 57 Hulme went out with a suspension failure and so sixth placed was inherited by Vittorio Brambilla (March). Lauda's Ferrari began to suffer from rear suspension trouble as well and the car became more and more difficult to drive which enabled Hunt to catch Lauda. It was not until the 66th lap that Hunt managed to get ahead. A few laps later Lauda retired with a gearbox problem. Hunt chased the Tyrrells but there was no way he could catch them and so Scheckter scored his first World Championship victory and became the sixth winner in seven races.